The medium for evaluating the suitability of a future publication is the peer-review process. This is known to the academic world for decades and all junior or senior scholars go through such a process after submitting a paper to an academic journal for consideration. However, the process is often not regulated by what we all understand peer-review to be, especially when it comes to articles that challenge long-established ideas and/or theories. Ever since I obtained my PhD three years ago, I have been engaged – like so many other young scholars all over the world – in academic writing, testing my theories and ideas by submitting them in the form of articles to various journals, in my case in the field of ancient Greek religion and the reception of ancient theories of religion in the early Christian period. In the process I have received peer-review reports ranging from positive to extremely hostile – nothing surprising here; I imagine there is not even a single scholar who has had only positive or only negative (even hostile) reviews. However, what in many cases has struck me is the reluctance of anonymous reviewers to accept a new theory or approach solely on the basis that it does not conform with what is taken to be an ‘authoritative’ interpretation/theory/approach in the field. Given the anonymity that governs the principle of a ‘fair’ peer-review, the writer has no knowledge whether the reviewers of her/his article are specialists in the respective field or not. However, one can easily discern if the reviewer is making her/his criticism based on solid and detailed knowledge or on a vague idea that s/he has on the subject. In the first case, one can profit from the review, since comments are informed, bibliographically well-established, and pose questions that can indeed enhance the quality of the paper – or even change it considerably if the author is not well qualified. In the second case, however, the review seems like a defense of other theories, most often based on secondary literature. By that I mean that for scholars like myself, who work on ancient sources, reviewers are often not acquainted with the sources at hand and base their own reviews on other scholars whose work they actually know. I confess that I have only become aware of the existence of this book recently, and have not yet seen it, while waiting to receive a copy via Inter-Library-Loan. Nevertheless, I would not publish a line on Euhemerus, his theories, and their history (in particular) without consulting this book. Given the fact that the report of the anonymous reviewer was negative and suggested the rejection of the article, certain issues are raised regarding how much authority one should acknowledge in his/her sources and how much in secondary literature. In the example above, should a scholar working on euhemerism take Winiarczyk’s analysis as ‘the’ appropriate way of dealing with Euhemerus’s theory or should the focus instead be on the ancient sources themselves? In addition, what is it that makes, in this case, Winiarczyk’s positions and arguments a necessity that prohibits scholars to actually publish “a line on Euhemerus” without consulting this book? 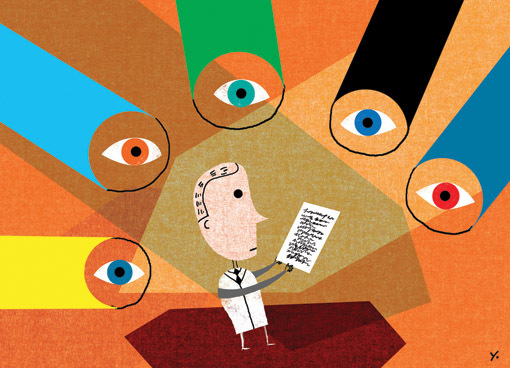 This tendency, often found in peer-review reports as I have come to realize in conversations with young and senior colleagues, raises another important issue: that of the freedom to review papers even if our field of expertise is partly or entirely different than the focus of the paper we are asked to review. Is a vague knowledge stemming from secondary sources enough for a reviewer to give a fair report on an article dealing with ancient sources that the reviewer has never actually read? One could thus argue that it would be inconceivable for Valéry to see a paper on Proust without Gide’s and/or Léon Daudet’s names in the bibliography; or, even worse, Valéry should deem a paper arguing about the low quality of Proust’s work as worthless since such an argument would contradict Gide and Daudet, even if Valéry himself would have never read a line of Proust’s works. So, where do we go from here? Is every scholar obliged to ‘not write a line’ on a subject without consulting what academia deems as ‘the’ work of art regarding that subject? And is such an argument valid even if the scholars who maintain this position have never read that authoritative work? Of course, it would be impossible for a scholar arguing against or in favor of, say, Mircea Eliade, without consulting his works. But should that article be deemed worthless if among the bibliography one will not encounter, say, Bryan Rennie’s works on Eliade? That would be the case if the author would present an interpretation already employed by Rennie as the major contribution of the paper; but that presupposes that the reviewer is well-acquainted with both Eliade and Rennie. Is the location of a book/idea/theory enough even if we have no detailed knowledge of its content? Nickolas Roubekas is a postdoctoral fellow at the Department of Biblical and Ancient Studies, University of South Africa, Pretoria. He’s studied in Greece, Denmark, and Scotland, and his PhD thesis was on Euhemerus of Messene and his theory of religion and myth (which was published in Greece by Vanias Publishers in 2011). He mainly works on euhemerism and is interested in ancient theorists of religion and myth and their reception in later periods as well as the religions of the Hellenistic Period and Christian origins. He currently acts as Book reviews editor for the journal Religion & Theology. This entry was posted in Pedagogy, Religion and Theory, Ruminations, Uncategorized and tagged Bryan Rennie, Marek Winiarczyk, Mircea Eliade, Nickolas Roubekas, Peer review, Pierre Bayard. Bookmark the permalink. Perhaps the issue is either the general unwillingness of many scholars to serve as peer reviewers–after all, it is voluntary work and often thankless–or (but also directly related to this) the lack of creativity/effort on the part of some journal editors in finding scholars capable of adding an informed and thus helpful commentary on a colleague’s work…? For I think anyone who has served in an editorial capacity for a peer reviewed journal has had the experience of invited readers repeatedly rejecting the opportunity to serve in this way, and thus those who do agree sometimes feeling burned out by the sheer volume of follow-up invitations. What’s more, the professional seems ambivalent with regard to the importance of serving as a journal editor (find me a Department that gives release time to a member because s/he is a journal editor…), much less the value of being an anonymous reader (what is it “worth” on our annual activity reports?). So I think that the problem Nikos identifies is a problem with the profession far more than with the anonymous readers. I agree with Russ McCutcheon’s description of the practical constraints of getting qualified, relatively well-informed evaluators and the often dismissive treatment of editorial work as somehow not contributing to “scholarship” per se. On the latter point, universities should, in my view, take a closer look at how editors can shape a field, something that is surely considered for promotion to full professor, if not prior to that point. However, I disagree with the position taken on anonymous readers who are not well-versed in the scholarly literature they are being asked to evaluate. It is not enough to say “Jane and Joan think this is important, so I do too.” Where is the scholarly rigour in that? While it is certainly true that scholars rely on the judgement of those whose work we respect and have found reliable (and the practical problems with doing otherwise are duly noted), the practical effect of so doing can set up prior terrains of inclusion or exclusion which themselves are not subject to query – as the an old article in the bad old days when “feminist” was enough to sink any possibility of respectful scholarly attention succinctly named: “Why you don’t have to read women’s writing to know that it’s no good.” Lineages of approval and and indeed, prestige, exist. What is remarkable is that some of the members of these lineages are able to *overtly claim* their lack of competence to judge, based on lack of familiarity with the material, and judge nonetheless. They doubtless are able to count their evaluations on their CVs as well, as scholarly service.